BeritaIndependent.Com | TNI headquarters denied the news that spread out in social media since a few days ago. The news said that President Jokowi had called a number of TNI high-ranking officers to hold a board meeting to the Palace on 13th February. But Jokowi didn’t invite TNI chief Gen. Gatot Nurmantyo. "The event was not a meeting of the armed forces commanders or Rapim. 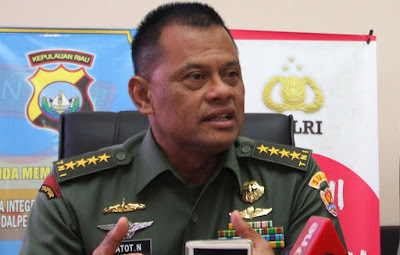 The High-military officers called by president because of promoted which their decision signed by the President," Major General TNI Kapuspen Wuryanto said Thursday (16/2). According to the Major Wuryanto, the meeting both of the President and TNI is only to follow up President’s policy. All military officers were promoted at the level of general military corps invited by President to the Palace. TNI submitted a corps report to the Palace in order to get a president’s signed as commander in chief of the TNI. "It has been going on long time ago. He is a civilian background, but he is the Supreme Commander of the military who hold a supreme power of the army, navy and air force. So all the high- ranking officer that promoted then called to the Palace to know, hospitable and shake each other, " Kapuspen said. "So do not be interpreted as meeting of Rapim or other activities," he added. TNI Kapuspen confirmed that Gatot Nurmantyo as TNI chief Gen and also the entire force chief did not attend. "They were not promoted whereas events just to know each other among the high- ranking officer TNI were promoted," he said.